Ever since Lara was born, Zingzillas has been the soundtrack to my dinner preparations. In the days before Lara could walk, I would plonk her in her rocker to listen to the sounds of Zingzillas as I chopped vegetables or made other preparations for dinner. For the first 7 months of Lara's life, I couldn't have told you what Zingzillas looked like, but I knew every single song! This is why I think I am probably more impressed with the new Zingzillas album than Lara is! for those who don't know, Zingzillas is a CBeebies TV program where Zak, Panzee, Tang and Drum are members of a band on a remote island. Each day they perform a 'Big Zing' where they play music of different types. As you know, Lara loves music and the tunes from the Zingzillas album are a great excuse for her to have a bop around the living room. The great thing about Zingzillas is that the music spans all genres and cultures so you get a good mix of styles and rhythms to encourage different musical tastes in your child. My favourite track is "Bubbly Pop" which is, pretty much as it describes and really encourages Lara to wiggle and bop. I think Lara's favourite is "Do You Digeridoo?" which is also a fast-moving track with digeridoo rumblings in the bakground. And Mr. B? I think he secretly enjoys "I've never heard a sound as absurd" which is known in the Mellow household as "The Oompah Song" which is in an alpine, euphonium, lederhosen stylee! 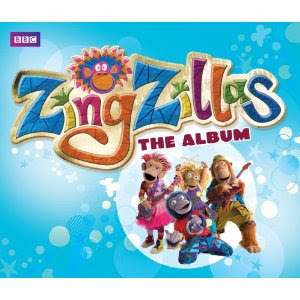 I think the Zingzillas album would make a wonderful christmas present for any tot as with 26 tracks, it really is very good value for money and offers hours of entertainment.